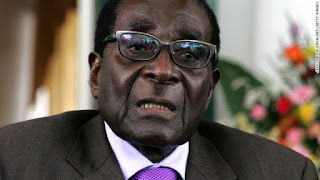 The undisputed ‘god’ or let me call him ‘messiah’ of Zimbabwe, his 'Excellency' president Robert Mugabe is a very hilarious and humorous man. I think he should join the likes of Eric Omondi and Churchill, because he is just funny,literary. You all remember the incidence when he publicly told POTUS, President Barack Obama to ‘marry’ him with the intentions of mocking the legalization of the gay marriage in the USA. Recently, the controversial president is rumored to have fired his Chief of defence for eyeballing the first Lady. 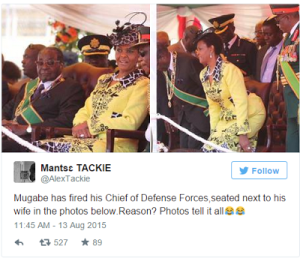 If Alex Tackie, a popular columnist twitter's post is true, then the Mugabe has allegedly fired him (Chief of defence) for staring at his wife’s bum.